On September 14, IBA Group announced the opening of its new premises in Prague, Czech Republic. The premises are intended for IBA CZ, the Czech-based development center of IBA Group. The same day, IBA CZ marked its 18th anniversary. Numerous high-profile guests, including IBA Group’s customers, partners, and government officials attended the opening ceremony. The event’s program included a ribbon-cutting ceremony, welcome addresses, and tours of the new premises, both virtual and real, a fingerstyle guitar concert, and a molecular gastronomy show. Sergei Levteev, IBA Group Chairman and Aleš Hojka, Managing Director of IBA CZ cut the ribbon to inaugurate the opening. According to Mr. Levteev, IBA Group applies the Agile methodology when building its infrastructure. Following the opening ceremony, the guests had a tour of the new premises that provide a spacious and comfortable environment for the growing IBA CZ team. With high-tech teleconferencing facilities, meeting rooms equipped with smart walls, phone boxes for private phone calls, a relaxation zone, a fully equipped kitchen, and a parking garage, the new premises meet the highest requirements for modern office space. Right after the tour, a group of motorcyclists broke into the open area. The motorcyclists were IBA Group’s employees from Minsk, Belarus. They took a vacation tour across Belarus, Slovakia, and Czech Republic, visiting IBA Group’s offices in these countries. 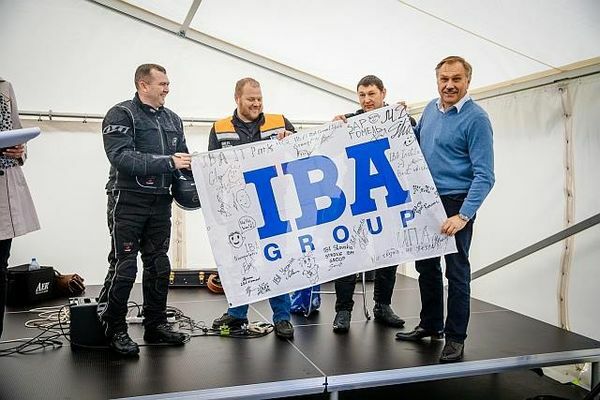 Devoted to the upcoming 25th anniversary of IBA Group, the motor tour marked the opening party in Prague as the crowning point of the motor route. The cyclists passed to Mr. Levteev the IBA Group’s flag that was signed by representatives of the IBA Group offices they had visited. IBA Group founded IBA CZ in Prague In 1999 and extended it to Brno in 2005. The same year, the company relocated its headquarters to Prague. Afterwards, IBA Group expanded its offices in Brno and in Prague, and established an office in Ostrava (2015) to meet customer demands for near–shore software development services.